Beach front condominiums in Cabarete for sale. 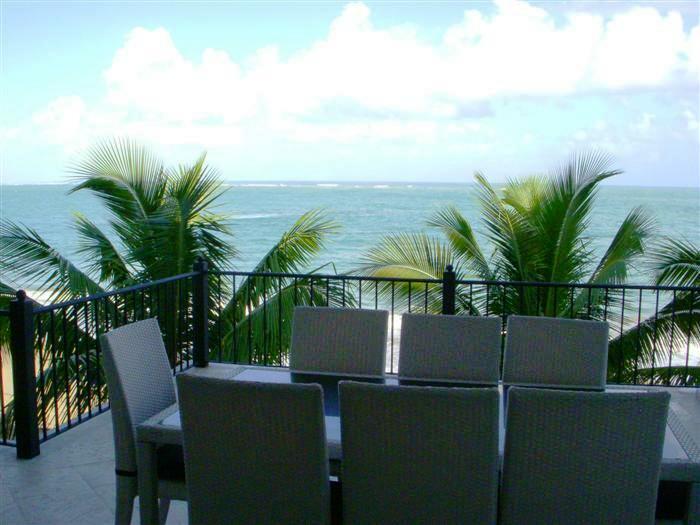 This is one of the most luxurious beach front condominiums in Cabarete. If you are looking for a condominium on the beach in down town Cabarete then look no further. This spacious and very modern condominium has been tastefully furnished with beautiful furniture and art work. The kitchen is fitted with custom designed wood cabinets, solid granite counter tops and stainless steel appliances including fridge, stove, hood fan, dish washer and a microwave. The stylishly furnished living area leads out to the balcony that offers spectacular views of the ocean and Cabarete beach. This is the perfect location to dine with friends whilst watching the sunset across the bay. The spacious master bedroom has a walk through closet that leads into a large spa style bathroom set in artisan stone work that has a bath tub, separate shower area, hide-away toilet area and double vanity sinks. From the master bedroom you can also access the balcony. There are two guest bedrooms, one of which has a full en-suite bathroom and there is a third separate full bathroom. This is the only condominium development in Cabarete that has underground parking. Each condo has their own parking space plus an owner’s storage locker. There are elevators running from the parking lot to the top floor. There is a private beach entrance that takes you straight onto Cabarete Beach which is lined with international restaurants and bars serving some of the best food on the North coast. This is one of the most luxurious beach front properties for sale in Cabarete and must be seen to truly appreciate the breath taking view. Please complete the request form for more information about this property and Dominican Republic real estate in general.